I feel like a bit of a dickhead doing makeup looks, I can't imagine why anyone would want to watch them when there are so many other people doing them but the requests keep flowing in so I'm going to do them as often as time permits, if you watch the vlogs you probably know how time stressed I've been lately but perhaps in the new year things will calm down a bit. Anyway, today's look is Christmas inspired with pink and gold, very wearable and easy peasy. No skill required. Base: Combination of Hylamide Photography Foundation in Golden Tan, Maybelline Fit Me Matte + Poreless Foundation and Cover FX Custom Cover Drops. I do everything I can to prevent shine and foundation breakdown due to oil so I use as many mattifying products as I can. I also like a full coverage but lightweight base, the combination of the Hylamide Foundation, Maybelline Foundation and Cover FX drops has been rocking my world lately (ratio 2:10-12:4, ie; 2 drops Hylamide, 10-12 drops Maybelline, 4 drops Cover FX). The concealer is primarily used under the eyes and around the nostrils and then heavily set with powder products. Once my face is fully complete I go in with the setting spray, I chose to use the Rea.Activate simply because I'm trialling it. Using Rendezvous in the crease as my transition shade not only helps to blend my crease shades but offers a nice soft edge and minimises the need for blending. The lid colours haven't translated well in the photo which is disappointing, as the light catches the lid at different angles the combination of Le Marais, Fleur & Bonjour create this awesome gradient effect, starting off as a white with pink shift, moving in to a pink with gold shift and ending in a solid gold. I wanted a deep crease but with this particular palette the options are limited, I went with mixing a shimmery bright purple with a matte black, this cuts the sheen down a little but isn't so stark as just using black. I followed on with a wing, skin coloured liner on my waterline and used my face highlight for the inner corner. After doing my brows and lashes, I set my brow bone with face powder and finally added some highlight the fleshy part of my brow bone. I really need to wax those brows. Cringe. I bronzed and contoured heavily because my face is significantly lighter than the rest of my body using Benefit Hoola. 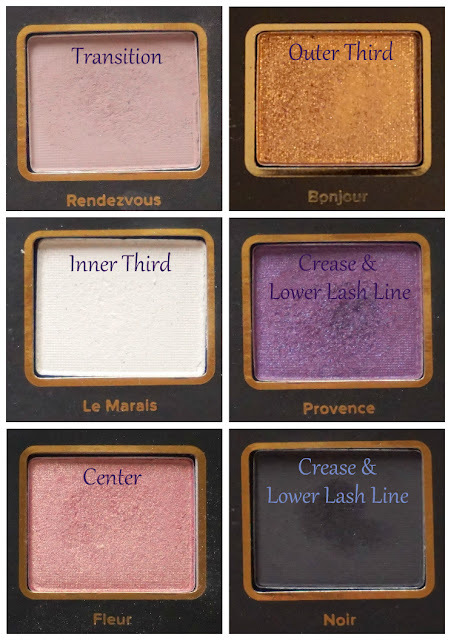 Using a Sugar Baby Eyeshadow from my Project Pan I hit all the high points of my face (heavily because I want to blind people when I go outside) and used Mademoiselle to keep my face nice and warm. Usually I would go for something bright on the lips like a red since that is very summery and Christmasy but I'm really not feeling reds at the moment, so dusty rose it is! I used the Max Factor Lip Liner in Cognac & NYX Lipstick in Minimalism. I had my camera set to portrait, sorry guys. I wish my skin looked that perfect. Dear life, please blur my pores like my camera can. Do you have a go-to Christmas makeup look?